Abstraction is any art that does not represent observed aspects of nature or transforms visible forms into a stylized image. Another definition (which I prefer) is that abstraction is the extreme simplification of forms, space, and lighting. Any way you look at it, the term defines much of what has been created in the 20th and 21st centuries around the world. It could also apply to works before the twentieth century, which constantly awes me. I’ve talked about the strict interpretation of “abstraction” in previous posts, but I think it always deserves to be repeated just so we don’t get complacent with the idea that “abstraction” is a twentieth-century invention. Japanese landscape painting ultimately derived from Chinese models, but quickly developed a distinctive Japanese style that was heavily influenced by Zen Buddhism. Chinese landscapes often hinted at great distance with large blank areas that indicated mist, usually between the foreground and middle ground, and middle ground and background. Suggestion was a key element in Chinese landscapes to intimate distance. It is the “atmospheric perspective” that eventually became part of Japanese landscapes. It represented the Zen idea of the “vast emptiness” of the soul before enlightenment. 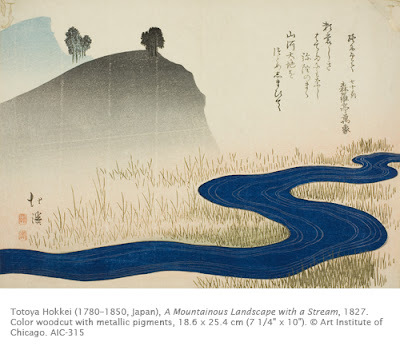 The great tradition of landscape painting in Japan, which persists to the present day, was translated into the woodblock prints that were so popular during the Edo period (1615–1868) in Japan. The heyday of the landscape woodblock prints was the early nineteenth century, characterized by artists such as Hiroshige (1797–1858) and Hokusai (1760–1849). 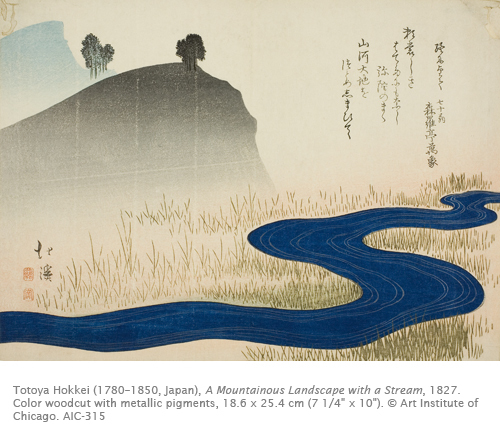 The landscape prints from the early 19th century in Japan had a profound influence on western painting, particularly among the Impressionists. Totoya Hokkei (1780–1850) was one of Hokusai’s best students. He had initially studied landscape painting with the noble Kano School, but eventually became Hokusai’s pupil, making his Ukiyo-e debut with illustrations for comic novels around 1800. He continued to produce prints of everyday life, but preferred landscape more and more, particularly after Hokusai published his famous Thirty-Six Views of Mount Fuji in 1836. While impelled to produce landscapes, his style was quite different from the master. The simplicity and lightness of value sets him way apart from other Ukiyo-e artists who were more concerned with depicting specific places. In this landscape, Hokkei displays the atmospheric perspective of painting, while reducing the landscape forms to hazy, simplified shapes. 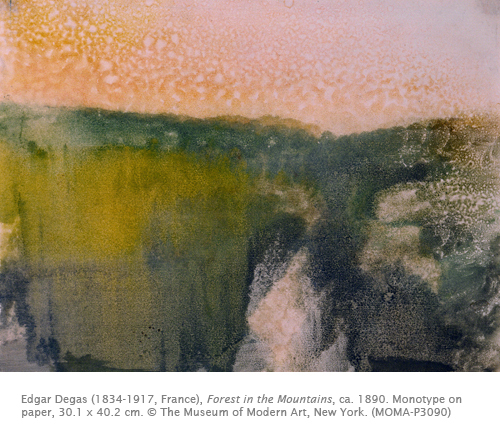 The effect is something that would resurface later in the century in Europe in such landscapes as Edgar Degas’ (1834–1917) monotypes. Activity: Draw an atmospheric landscape. Using colored chalks, pastels, or charcoal, create a landscape that has the suggestion of depth through the use of smudging the medium. 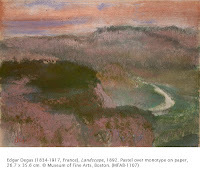 Draw an imaginary landscape in which the foreground, middle ground, and background are each separated from on another by areas of mist (smudged medium). If blending sticks are not available, put a tissue or paper towel over the finger and smudge (blend) areas of medium together to suggest distance between the parts of the landscape.